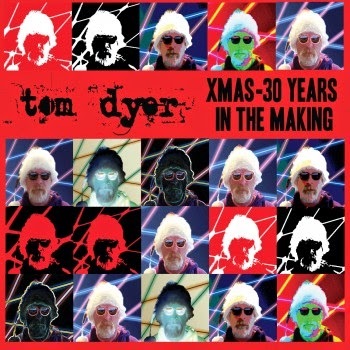 JP's Music Blog: CD Review: Tom Dyer Brings Us Xmas Memories "In The Making"
CD Review: Tom Dyer Brings Us Xmas Memories "In The Making"
Seattle's underground music label Green Monkey Records has been producing some of the Northwest's most unappreciated rock music for over thirty years. Started by Tom Dyer, the label has maintained a steady fan base and artist list as band's are allowed to create some truly unique pieces of music. One of the label's most recent releases is Tom's own Christmas album entitled "Xmas - 30 Years In The Making." The music sticks true to its title as Tom would record a Christmas song here and there and thought that eventually he would have enough for an album. That time had finally arrived in 2014 as Tom put together fifteen of his best songs for this new set of underground holiday standards. Beginning with the two-minute "It's Christmas (And I'm Jolly)," Dyer gets you in the mood with his type of a gospel choir, belting out "Ho, Ho, Ho" and "Merry Christmas, Merry Christmas." The album's first single, "No Lou This Christmas" is a tribute to the late-Lou Reed as Dyer plugs in for this rocker. Dyer adds a nice, loose rhythm to "Jingle Bells Ska," and turns "Peace On Earth" into a spaghetti western, before bringing out the kid in all of us with the fun vibe of "Hot Dog! It's Christmas!" A great piece of holiday folk music is "Snowing In Seattle," which sounds as if it was recorded right on the spot, in one take as Dyer was looking out the window. The album closes with a couple of traditional Christmas songs ("God Rest Ye Merry Gentlemen" and "Angels We Have Heard On High") not exactly done in the traditional way, but very much a welcome addition to your holiday festivities. To find out more about Tom Dyer's Christmas album "Xmas - 30 Years In The Making," please visit greenmonkeyrecords.com.